When most people hear the words “presentation software,” two popular packages immediately spring to mind: PowerPoint and Keynote. While those are not the only ones out there, it’s often hard to name specific alternatives immediately. Flowboard hopes to change that with the debut of its Mac desktop package, a companion to its year-old iPad app of the same name. While this newcomer has taken an unusual route — the mobile version preceded the desktop version — its developer believes that will emphasize the product’s online, interactive focus. 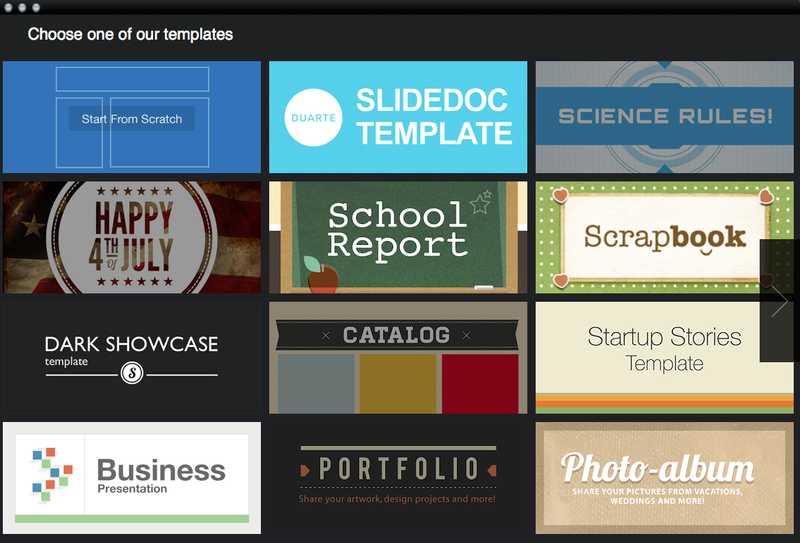 There are a variety of templates to choose from and the layouts can be tweaked. Because the presentation lives online by default, it’s easy to embed into blogs, websites, and social networks. The software also supports embedding PDFs as well as exporting to PDF for printing, if needed. Getting started with Flowboard is simple. Indeed, I never needed to consult the manual in putting together a multipage presentation. After you launch the program, a choice of some 25 built-in templates serves as a starting point for creating your own variations on the theme. Within the templates, menus for each element let you customize individual items on the page. Choose from 17 different fonts with varying styles and colors, insert and crop images, bring items to the foreground or background and set up links. Each template has six layout variations, but you can use your content to tweak them. Every item has parameters that can be customized and adjusted. There’s a choice of 17 text fonts. You can insert a variety of multimedia elements into your presentation including images, galleries, video content (which can be from YouTube or Vimeo too), shapes and PDF files — but not sound. The Mac’s built-in color picker can be used to change background and font colors. Add as many pages as you want, but Flowboard recommends 20 or fewer. There are a number of sophisticated controls that let you refine your design and make it easier to work. 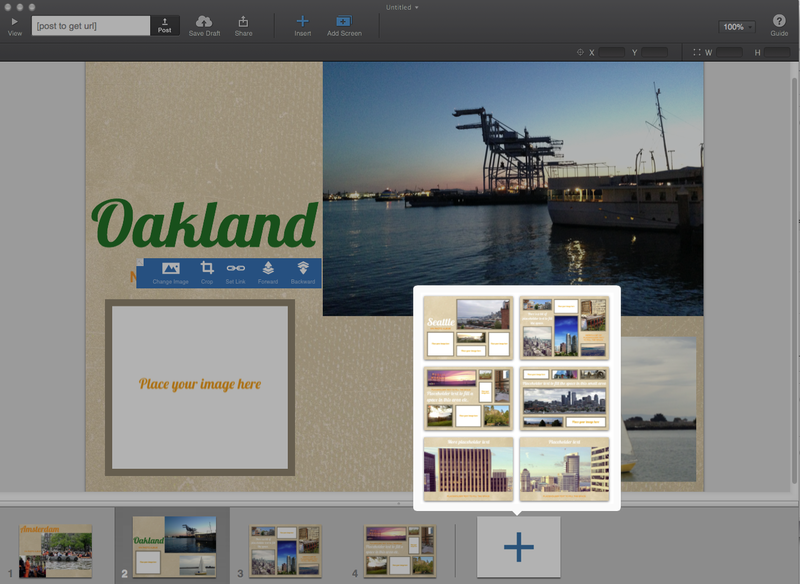 Snap guides are enabled by default and an artboard lets you stash extra objects within easy reach. There are six page variations for each theme. You can add as many pages as your want to your presentation. 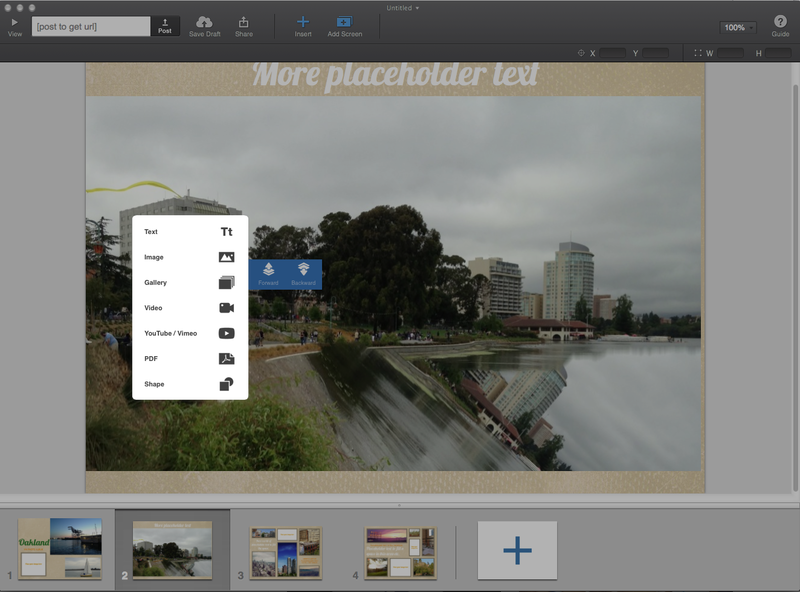 The desktop version also lets you add shapes, full color, opacity, and offers an X-Y menu that shows where objects are located on the canvas. 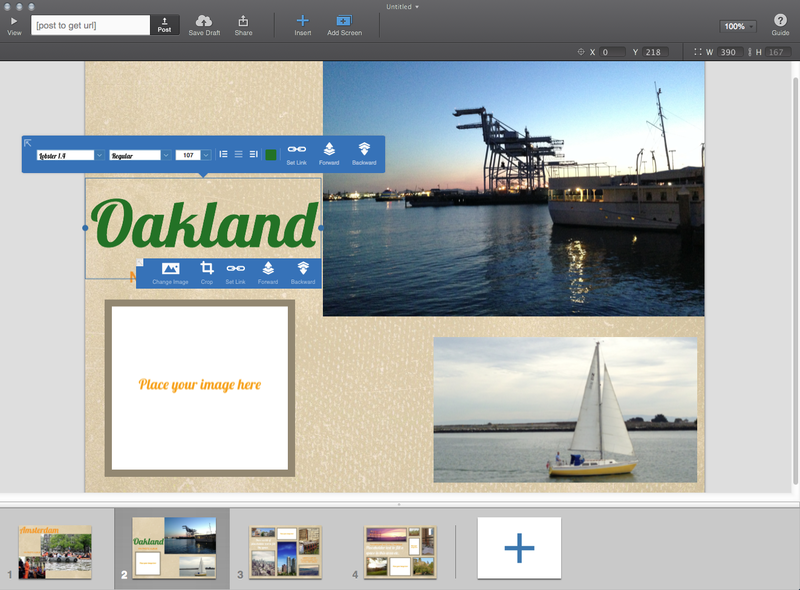 You can go back and forth between the desktop and the iPad after you publish the presentation or just present directly from the iPad. You can insert and link to a variety of elements. To save your presentation online, you can create a free account, or log in via Facebook. A unique URL is assigned for easy sharing when you’re done with your presentation, but you can also set privacy restrictions to limit its public exposure. Flowboard for Mac is available on the Mac App Store to the first 10,000 buyers for an introductory price of $9.99. After that, the price will jump to $19.99. The iPad app is free.